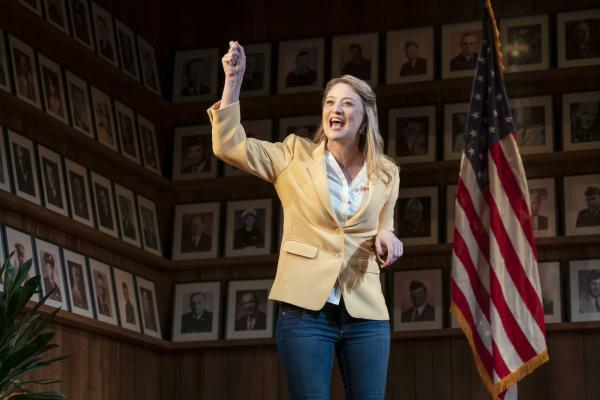 Heidi Schreck's What the Constitution Means to Me opens on Broadway on Sunday. Actor and playwright Heidi Schreck says her new play — What the Constitution Means to Me — is a love letter to her mother. 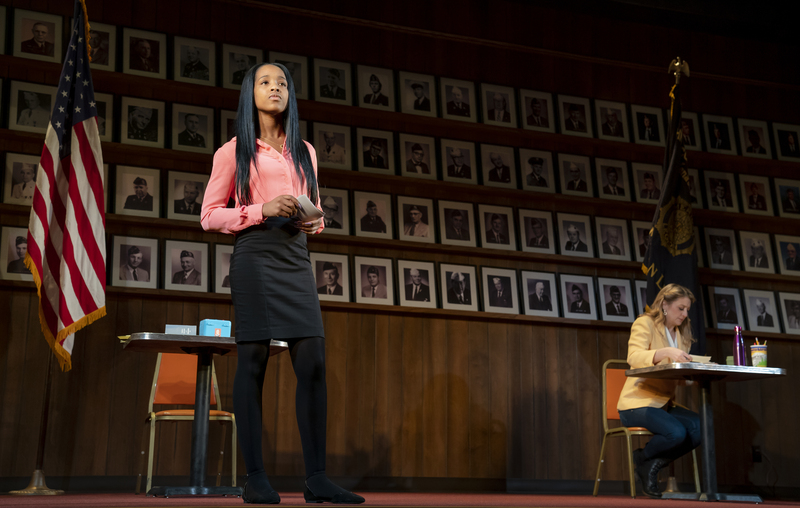 The Broadway play — part personal memoir, part civics town hall — recreates the constitutional debate contests Schreck attended in high school. It's an attempt, she explains, to trace her evolving understanding of the U.S. Constitution and how it relates to her life, her family, and the women in her family in particular. Schreck says she wanted to explore "how their existence had been shaped by this document, circumscribed by this document, and, in some ways, harmed by this document." Schreck's mother and grandmother both suffered abuse — as a teen, her mother testified against her own stepfather. "I now fully apprehend the incredible bravery it took for her to testify against a sexual abuser at age 14," Schreck says. Schreck reveals her family's painful history of abuse through the prism of the Constitution. Sara Holdren, New York Magazine's theater critic, saw the show off-Broadway last fall, on the evening after the Christine Blasey Ford/Brett Kavanaugh hearings, where the Supreme Court nominee faced allegations of sexual misconduct. "It's rather terrifying, because she goes back and kind of traces the ways in which dehumanization is written into the document," Holdren says. The amendments are key, says Schreck. Her favorite is the Ninth Amendment, which states: The enumeration in the Constitution, of certain rights, shall not be construed to deny or disparage others retained by the people. "This little, tiny, magic amendment, right there at the end of the Bill of Rights ... says there are rights that we did not list in this document," Schreck says. "You have those rights. We don't know what they are — we're not going to tell you — but they're there." The audience takes away different things from the play with each changing news cycle says director Oliver Butler. "When she talks about the 14th Amendment protecting you from the government taking anything or anyone from you — before we became aware of the children being taken away from their parents at the border, that didn't hit in the same way," Butler says. As Schreck developed the play, she was surprised by how emotional she became performing it in workshops. "When I spoke it out loud in public ... I was overwhelmed by terror and grief," Schreck says. That led her to the realization that she didn't want to be on stage alone. Schreck decided to write a role for the contest proctor, played by Mike Iveson, and also incorporated a debate with an actual teenager. Thursday Williams is a student at William Cullen Bryant High School in Queens. She alternates performances with Rosdely Ciprian, another young debater. Thursday Williams is a 17-year-old high school student in Queens who hopes to one day to serve in Congress. She alternates performances with another young debater, Rosdely Ciprian. In a partially improvised debate at the end of the show, Williams makes the case for preserving the Constitution. "The Constitution is the keys to our liberation," she says. "We have the oldest active constitution in the world. My opponent wants you to think this is a bad thing, but the reason it has lasted so long is because it gives 'we the people' the tools we need to free ourselves from tyranny." Williams says she's put in the position of defending a document that once didn't protect her — but she's looking ahead to the future. "I'm now in this document, and I'm now protected and we're going to continue moving forward," she says. Schreck says after the Broadway run, she'd like to take the show on the road, to states both blue and red, in hopes that it will spark civic debate. She wants the play to "make space for us to all be in a room together and think about the future of our country." When Heidi Schreck was a teenager, she went to American Legion halls across the Pacific Northwest and participated in constitutional debates to win tuition money for college. Now in her 40s, Heidi Schreck has created a new theater piece, "What The Constitution Means To Me," that officially opens on Broadway tomorrow night. Jeff Lunden reports it's kind of a personal memoir/civics town hall, and it's also funny. JEFF LUNDEN, BYLINE: In "What The Constitution Means To Me," Heidi Schreck recreates her high-school debate contests. MIKE IVESON: (As character) Clause Three - nor shall any state deprive any person of life, liberty or property without due process of law. Your time begins now. HEIDI SCHRECK: (As character) Clause Three is the most miraculous in our entire Constitution, the due process clause. We stole it from the Magna Carta. It ensures that the government cannot lock you up, take your stuff or kill you without a good reason. SCHRECK: I thought it would be fun to go back and make a piece about that contest and also, in doing that, just trace how much my understanding of our country has changed in the last 30 years and my understanding of myself and also my understanding of the lives of four generations of women in my family and how their existence had been shaped by this document, circumscribed by this document and, in some ways, harmed by this document. LUNDEN: In particular, her mother. SCHRECK: This play is like a love letter to my mom that took me a very long time to write. LUNDEN: Her mother and grandmother both suffered abuse. And her mother testified against her stepfather. SCHRECK: I remember she wrote a letter to the editor when I was in high school supporting a girl who would come out to accuse a teacher of sexually abusing her. And this is in the '80s. She wrote a letter, talked about her own abuse. And I just - you know, 30 years later, I now fully apprehend the incredible bravery it took for her to testify against a sexual abuser at age 14. LUNDEN: Schreck reveals her family's painful history of abuse through the prism of the Constitution. New York Magazine's theater critic Sara Holdren saw the show off Broadway last fall on the evening after the Blasey Ford-Kavanaugh hearings, where the Supreme Court nominee faced allegations of sexual misconduct. SARA HOLDREN: And it's rather terrifying because she goes back and kind of traces the ways in which dehumanization is written into the document and then, as time progresses, was, you know, maybe amended or maybe kind of stitched over or maybe brought forward. LUNDEN: The amendments are key, says playwright and actress Heidi Schreck. SCHRECK: A lot of the decisions that later happened in regard to women's bodies were located primarily in the 14th Amendment and the Ninth Amendment, which is my very favorite amendment, this little tiny magic amendment right there at the end of the Bill of Rights that says there are rights that we did not list in this document. You have those rights. We don't know what they are. We're not going to tell you, but they're there. SCHRECK: (As character) Justice Harry Blackmun used the Ninth Amendment to find the right to privacy in the 14th Amendment. And he argued that this gave a woman the right to decide what to do with her own body. Well, actually, he argued that a doctor and his patient have a right to privacy so that he can decide what to do with her body. LUNDEN: The audience takes away different things from the play with each changing news cycle, says director Oliver Butler. OLIVER BUTLER: When she talks about the 14th Amendment protecting you from the government, taking anything or anyone from you - before we became aware of the children being taken away from their parents at the border, that didn't hit in the same way. LUNDEN: As Heidi Schreck developed the piece, she was surprised at how the things she'd written hit her when she performed it in workshops. SCHRECK: I found that when I spoke it out loud in public that I was overwhelmed by terror and grief. So I thought I would really like not to be alone up here. Who could be up here with me? LUNDEN: So she decided to include the proctor of the contest, played by Mike Iveson, and to create an actual debate with an actual teenager. THURSDAY WILLIAMS: My name is Thursday Williams. I am 17 years old. I go to school at William Cullen Bryant High School in Queens. LUNDEN: Thursday Williams hopes one day to serve in Congress. In a partially improvised debate at the end of the show, she makes the case for preserving the Constitution. WILLIAMS: (As character) The Constitution is the key to our liberation. We have all the oldest active constitution in the world. My opponent wants us to think this is a bad thing. But the reason it has lasted so long is because it gives we the people the tools we need to free ourselves from tyranny. LUNDEN: It's heady stuff, says Williams, who alternates performances with another young debater. WILLIAMS: In the part of the play, the role that I got is defending this document that once didn't protect me. But I think it's a matter of how we move forward and how I'm now in this document and I'm now protected. And we're going to continue moving forward. LUNDEN: Moving forward, Heidi Schreck says, after the Broadway run, she'd like to take the show on the road to states both blue and red in the hopes that it will spark civic debate. SCHRECK: It's designed to be that, to open up into an actual conversation and to make space for us all to be in a room together and think about the future of our country and what we want our lives to look like and what's important right now and to actually talk to each other.